The Mission Aircrew School (MAS) is an intensive weekend of flying, intended to bring aspiring aircrew, i.e., trainees, up to their standard ratings either as Mission Pilots (MP) or Mission Observers (MO). In addition, almost all of the base staff and ground crew members had training opportunities. Squadron 188 sent three MP trainees (Maj Steven DeFord, 2d Lt Eric Choate, and Capt Georgios Michelogiannakis), two MO trainees (2d Lt Hollerbach and 2d Lt Gast). Our squadron was also represented by base staff volunteers: 1st Lt Jordan Hayes, completing his Air Operations Branch Director (AOBD) training as an Air Ops Group Supervisor, and Maj Maggie Wang, training as Mission Safety Officer (MSO). 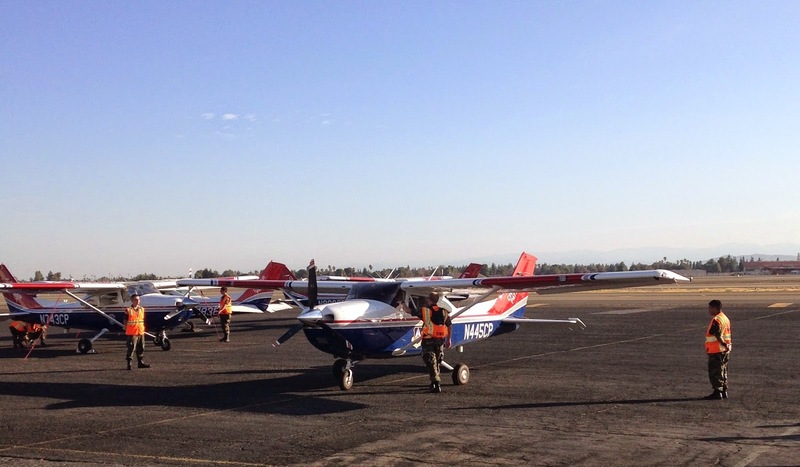 To attend MAS for aircrew work, we needed to previously commit to participating in a weekend of ground school. 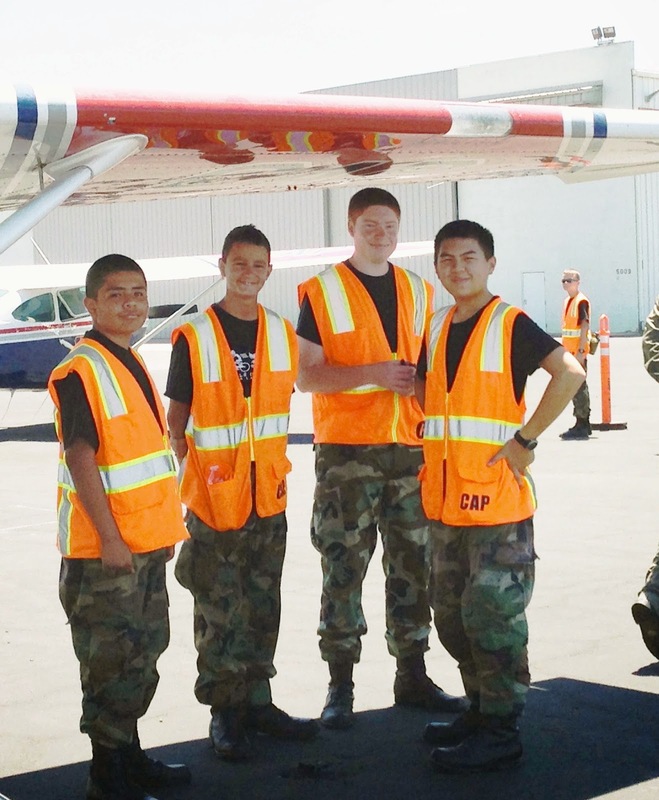 All of our squadron’s aircrew trainees had attended that class in Oakland in June (click here for a description). 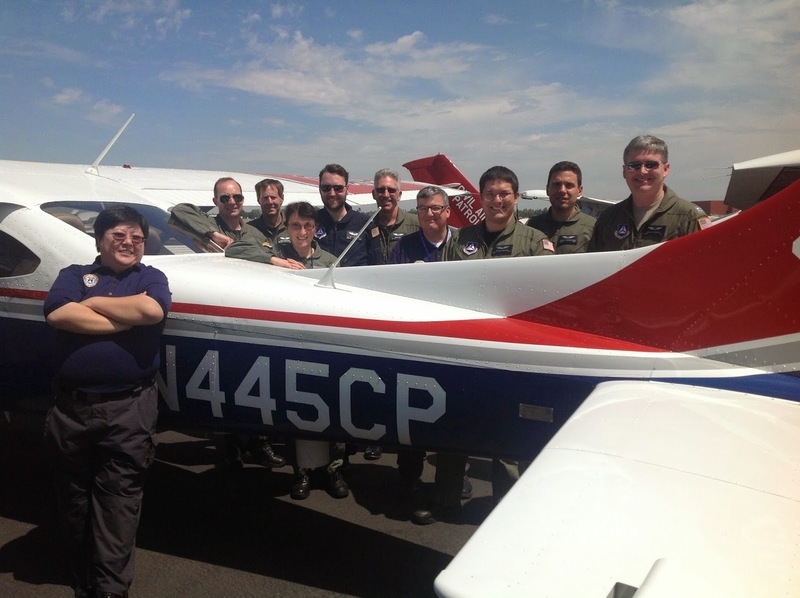 As the MAS was a Wing-wide event, another ground school had also been held in Southern California in May. This past weekend in Fresno, it was time to apply all that we learned on the ground. The MAS commandeers a large fraction of the planes in the Wing, and you get to fly with the same crew (including an MP, an MO, and an experienced "mentor" pilot in the back) all weekend. CAP 445 and other CAP aircraft ready for the next sortie. 2d Lt Gast and Capt Michelogiannakis met on Friday morning at the Oakland hangar, where they flew CAP 445 to KFAT, and then flew the same plane together all weekend before returning home. Due to uncertainties about plane availability (maintenance work being completed on Friday morning), rather than accompanying 2d Lt Choate and Capt Joshua Edwards from Palo Alto, 2d Lt Hollerbach drove in air conditioned comfort with 1st Lt Hayes in the van, and then 2d Lt Hollerbach and Maj DeFord flew 451CP from KFAT. 2d Lt Choate and Capt Edwards flew together all weekend, along with their MO trainee, Capt Tom Sheahan. Thank you to all 3 aircrews’ mentor pilots for providing excellent training support and mentoring: Capt Edwards, Capt Tom Barbre, and Capt Tom O’Connor. Many other people made MAS come together so successfully, of course. Among them - also a big thank you to the cadets working the flight line. All of the aircrews were assigned a sortie on Friday afternoon, two sorties on Saturday, and a fourth and final sortie on Sunday morning, before heading home. Collectively, the sorties included parallel searches, contour searches, ELT searches, creeping line searches, and point (expanding square) searches. Some planes had G1000 capabilities, others had round dial with GX55. Since the planes we fly most often here are G1000, our crews all were placed in G1000 planes. As in real life, several aircrews experienced equipment problems. 2d Lt Hollerbach and Maj DeFord had radio communications problems to overcome. In the first instance, we had to switch aircraft. In the second instance, we worked with another aircraft in the air, in order to effectively communicate with the base. Real world training! To quote Capt Edwards, MAS is “a hot and sweaty affair” – with temperatures well over 100 deg F each day, density altitude – not to mention aircrew performance – needed to be considered carefully. On Saturday afternoon, 2d Lt Hollerbach and Maj DeFord’s crew was thankful to return after a successful sortie, bouncing around in hot and turbulent air during a contour search. 2d Lt Gast was able to practice communications with the ground team during their ELT search. They enjoyed good practice using the Becker (Rho-Theta), and dusted off the aircrew text to make sure they read ground-to-air signals correctly. The ground team practiced ground-to-air signaling with a mirror (which works surprisingly well), and found and silenced the beacon. 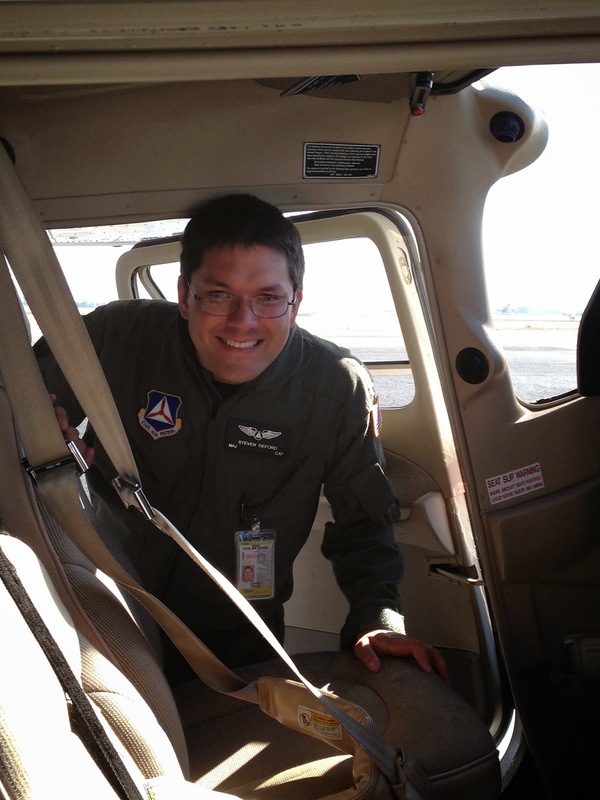 For 2d Lt Gast, seeing the CAP vans move at his command was the most rewarding mission he flew. Contour searches were challenging for the MPs. 2d Lt Gast’s grid had a maximum elevation of around 5500 feet, so we boxed the grid at 6500 feet, where it was substantially cooler than ground level. Unfortunately, the hills in 2d Lt Hollerbach’s search were at much lower elevation, so our contour step-down had to be flattened out to 100-200 ft – but for training purposes, we still got the idea! 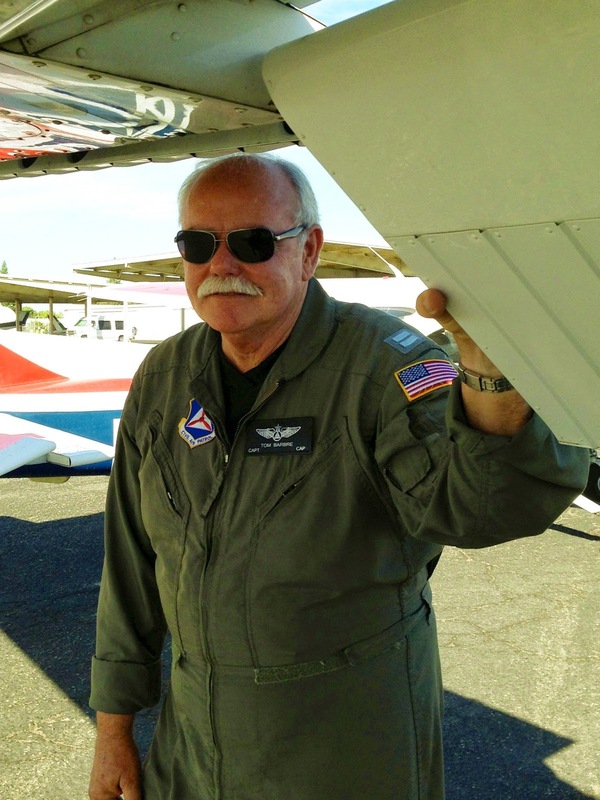 Contour searching is a lot like what 2d Lt Gast does in a glider, but in reverse. In a glider, you release from tow and fly close to terrain to get the lift up to the top of the ridge, so you climb up. In a contour search, you make passes off the side of the terrain and go lower, so the altimeter spins the wrong way. Even though the day was calm at altitude, there was light turbulence off the mountains. 2d Lt Gast was able to talk about the terrain and what was likely kicking off thermals and making the airspeed indicator dance. His glider flying made this just another day in the air, and Capt Michelogiannakis was such a precise pilot that it was no big deal. Another interesting sortie was the flight home. A pilot in distress landed at Crow’s Landing, an old NASA training field that's been closed but is still usable. Capt Edwards flying CAP 448 relayed messages to and from the plane for Norcal. 2d Lt Gast and Capt Michelogiannakis heard the drama and were ready to head north if needed because they’d been given too much fuel before departing Fresno. 2d Lt Hollerbach heard about the events afterward – and found them a little disconcerting, as she had previously flown the plane we believe was involved in this emergency. Fortunately, the plane landed safely. Two different TV stations came to interview people at the MAS, so the event also served to help the public understand the important community services that CAP provides. MAS was a great success! 2d Lt Choate, Maj DeFord, and Capt Michelogiannakis are now working hard on preparing for their Form 91s, to complete their MP standard ratings. In the meantime, 1st Lt Hayes earned his standard AOBD rating, and 2d Lt Gast and 2d Lt Hollerbach are now fully qualified standard MOs. Calling all MPs – we are both standing by to act as your Mission Observers in any upcoming missions!